Irreco Installing A New Retaining Wall With Built -In Garden Beds On The Front Of An Existing Porch. We install landscapes throughout St. Louis, MO. Irreco LLC is a locally owned and operated landscaping company based out of St. Louis, MO. We specialize in complete landscape design, landscape construction and installation services. 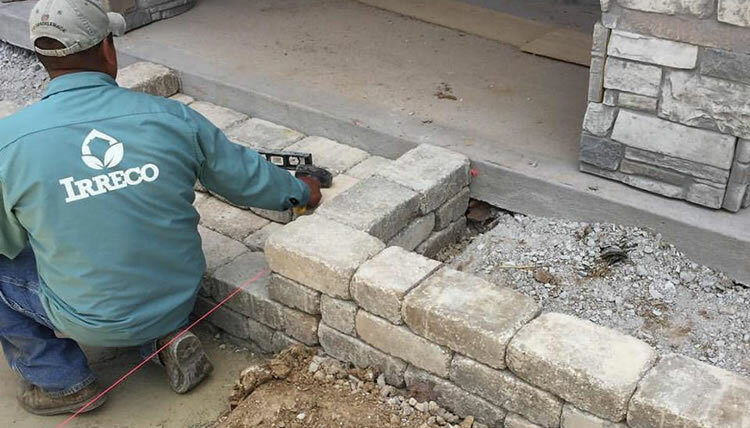 Whether you’d like a new brick paver patio, a new retaining wall, or a complete front or backyard landscape installed the Irreco team can build it for you. Softscaping refers to the live horticultural elements (plants, trees, bushes, shrubs) of a landscape design. Softscape installation for your new landscape can include planting flowers, plants, shrubs, trees, and building flower beds. Softscaping can also include regular maintenance activities such as lawn care, weed control, and pest management. Softscapes (because they are often living) require more frequent maintenance than a hardscape and usually require the addition of irrigation or sprinkler systems to keep them well watered. Hardscaping refers to hard landscape materials or “man-made” aspects in a landscape design. Hardscape installation can include paved areas such as driveways, new retaining walls, pathways and walkways, brick or paver patios, fences, gazebos, pergolas, and any other landscaping that is made up of hard wearing or natural materials such as wood, stone, brick, block, or concrete. Hardscapes are generally lower maintenance aspects of a landscape design and for this reason hardscaping is a very popular choice for any modern landscape installation. Do you want to have a new landscape installed but you’re just not sure what to do or how to best utilize your property? We offer landscape design services to our clients looking to improve their landscape but they just don’t know where to start. A consultation with our design team can open a world of possibilities for your landscaping depending on your property, your needs, and your budget. Why Choose Irreco LLC For Your New Landscaping? When you choose Irreco to install your new landscape you are partnering with a small, locally owned, family run landscaping business. We are the perfect team to help you transform your property into the envy of your neighborhood. The Irreco team is large enough to install and build landscapes of all sizes but we’re still small enough to give your new landscape the specific care and attention it needs to make the big impact on your curb appeal and lifestyle that we’ve promised. We believe in providing great service and value along with complete customer satisfaction with every project we complete! We will conduct ourselves like true professionals on your property at all times, leaving no trace behind but your beautiful looking new landscape! If you’d like an estimate for our landscape installation and construction services please give us a call (314) 246-0099 or fill out our contact form and we’ll get right back to you.